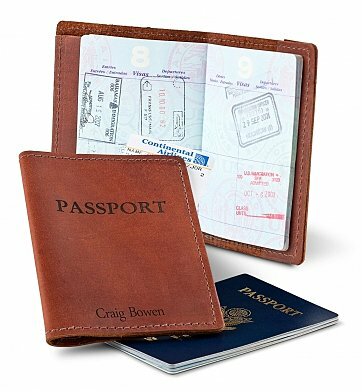 Sourced from top grain leather, this soft and supple passport holder is sure to become the constant companion of your favorite world traveller, keeping their passport and any travel documents safe, secure and stylish. One Craftsman Top Grain Leather Passport Holder. Gift arrives presentation-ready in signature gift wrap. A free card with your personal message is included with your gift. Embossed Leather Passport Holder is a hand delivered gift. These gifts are delivered by one of our local design centers located throughout the United States and Canada. Same day delivery is available for most gifts when ordered before the cutoff time. The cutoff time for Embossed Leather Passport Holder is 2 PM in the recipient's time zone. Refined, vintage-style leather passport holder, handmade in the USA. Complimentary embossing of your chosen name or message on the cover. Arrives in presentation-ready gift wrap. The Embossed Leather Passport Holder was exactly what I was looking for. I bought one for myself and my wife as a gift. She loved it too! I love the look, the soft feel of the leather and also the free embossing. I gave this as a birthday gift and the recipient absolutely loved it. She had been looking for one and this fit the bill and in having it personalized made it even nicer. Perfect!!!! I was really impressed with the way they wrapped the gift. I really liked the way they delivered on time, and also how easily I could pay them with PayPal. I stay in Germany, and had sent this gift to my husband in the US. He was so excited to see this beautifully wrapped gift in leather! It looks really fancy, and the card with the message is an icing on top of the beautiful gift! I will make more purchases from GiftTree in future as well. Thank you GiftTree! Looks like it'll work great. Purchased the passport holder for a graduation gift. The quality of leather along with the stitching is very impressive. I can hardly wait for the recipient to open it. A perfect 10! The final product was beautiful, classy, and manly. My husband loved it! We gave this as a graduation gift and he loved it! The product quality is great. Packaging was beautiful as well. We'll definitely order more passport holders for the rest of the family members. A wonderful gift, beautifully presented. This was an incredibly simple & smooth transaction. The gift recipient was impressed & very appreciative. I would highly recommend this service & plan to utilize it in the future. Loved the wrapping and prompt service. Product of good quality and carefully wrapped. I was told by my friend that the gift was beautifully wrapped and that he just loved it!! Order one for myself before considering giving as a gift. I looked at several different vendors before placing this order. Received this very promptly and very pleased with the quality. I now will order other for friends and co-workers. I gave this to my husband for Christmas and he was very happy with it. Delivery was timely and ordering was convenient. Thanks! This was such a perfect gift for my boss who is moving out of the country. Professional, sleek design, and the leather smells fantastic! Bought this for a birthday gift and was very pleased. Was not only pleased with the product, but the shipping was extremely fast and the wrapping paper was perfect. Will order from GiftTree again. Recipient loved the quality and workmanship. Nicely packaged and arrived in time as promised. Such a lovely gift at such a great value. I love the look of distressed leather and the engraving came out very well. Each passport cover also came wrapped in cute "globe" wrapping paper with a bow. Great presentation. And the ordering/shipping was very quick - a turnaround of only 4 days. I definitely recommend this! Order two of these for my friends and both of them enjoyed them quite a bit. This is a perfect gift for those that travel a lot. Great way to make them think of you when they are on the go. Everything about the gift was fantastic! Exceeded my expectations! The recipient of this gift was thrilled. Elegant, sturdy, should represent a lifetime of memories! I loved the passport covers--they exceeded my expectations. I wanted them for a friday shower gift. I ordered on the phone and the person with whom I spoke was extremely helpful. They were sent immediately, and wrapped in wrapping paper with a travel theme. That was the "icing on the cake." Very beautiful. Will purchase more.